In 1978 Vyborg Shipyard joined offshore market with semi-submersible drilling rigs for oil and gas exploration and production on the sea shelf. 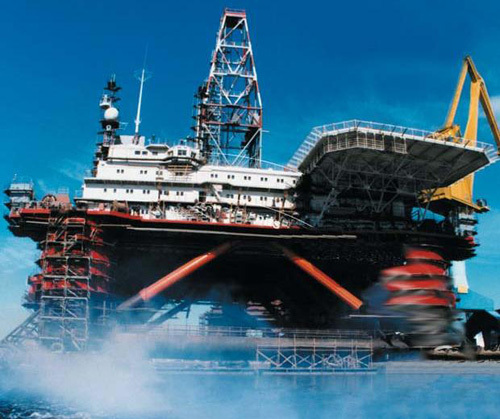 The floating semi-submersible drilling rig SHELF is designed for exploratory deep well drilling (6000 m) at water depth from 80 to 200 m.
Height from bottom of pontoon to the top of derrick — 94,0 m.
Full displacement — 19770 t.
At the initial stage of building of offshore facilities Vyborg Shipyard delivered for the Caspian Sea block-modules 900 t and pontoons for 6 semi-submersible drilling rigs to be finally assembled in Astrakhan. Scope of delivery of Vyborg Shipyard was about 35 % of the total scope of the semi-submersible drilling rigs. From 1985 to 1991 Vyborg Shipyard built 4 turn-key semi-submersibles for open seas.